A smorgasbord of surprising, obscure, and exotic words. 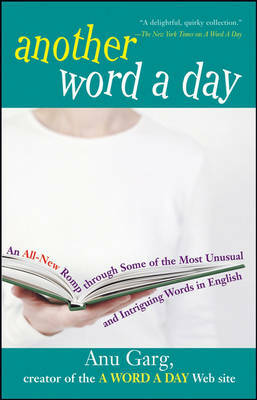 In this delightful encore to the national bestseller "A Word A Day", Anu Garg, the founder of the wildly popular A Word A Day Web site (wordsmith.org), presents an all-new collection of unusual, intriguing words and real-life anecdotes that will thrill writers, scholars, and word buffs everywhere. "Another Word A Day" celebrates the English language in all its quirkiness, grandeur, and fun, and features new chapters ranging from "Words Formed Erroneously" and "Red-Herring Words" to "Kangaroo Words," "Discover the Theme," and "What Does That Company Name Mean?" In them, you'll find a treasure trove of curious and compelling words, including agelast, dragoman, mittimus, nyctalopia, quacksalver, scission, tattersall, and zugzwang. Each entry includes a concise definition, etymology, and usage example, interspersed with illuminating quotations. Praise for a word a day "Anu Garg's many readers await their A Word A Day rations hungrily. Now at last here's a feast for them and other verbivores. Eat up!" - Barbara Wallraff, Senior Editor at The Atlantic Monthly and author of "Word Court" "AWADies will be familiar with Anu Garg's refreshing approach to words: words are fun and they have fascinating histories." - John Simpson, Chief Editor, 'Oxford English Dictionary'.